… clearly set out the need and the promise of the digital age. 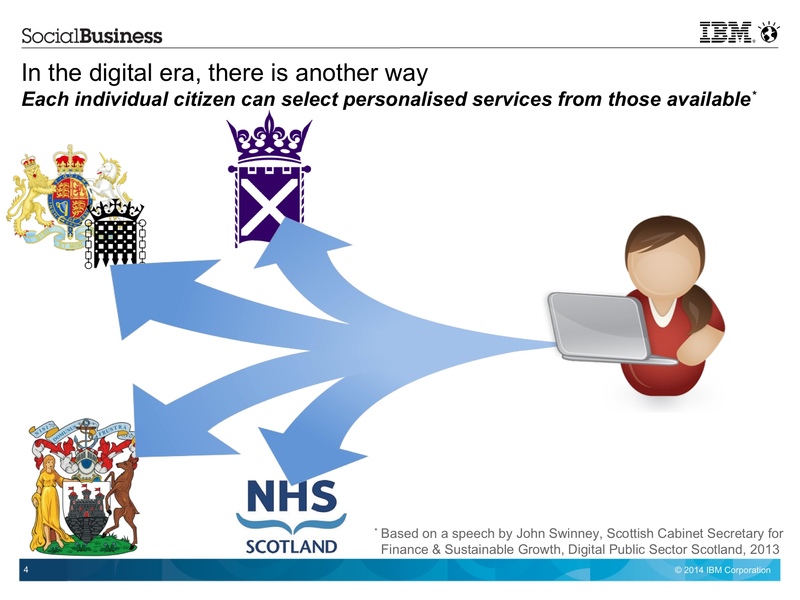 To move from government programs that are what they are, and either match a citizen’s needs or don’t, to delivering the personalised services that each individual citizen requires. I was reminded of this listening to him present the keynote at ONE Public Sector Scotland last week, where he discussed progress made, the importance of enabling public sector workers to be empowered to do the right thing for the individual in front of them, and the need to become “relentlessly person-centred”. However, you can only go so far down this path through technology, by providing a single front end that unifies services – or even by integrating back end services to smoothly move the user from one web site to another to deliver a coherent user journey that takes the citizen to what they need without them having to understand the internal structure of the government agencies providing it. To truly deliver an exceptional citizen experience, you need the government agencies involved, or more accurately the employees within them, to collaborate seamlessly as well. This isn’t just about coordinating applications across the government web sites. Or even simply about aligning policies and procedures across government departments. Rather the issue is that: not only does the public not care which government department, agency, or public sector body is providing the service they need, but they want to be able to access the knowledge and expertise of public sector employees without worrying about which bit of the government pays them. The good news is that responding to this desire not only produces more effective government services, it can also create more efficient ones. Initiatives like the Government Digital Service and G-Cloud have made good progress in reducing the cost of public services while improving their effectiveness. Now it is time to take things to the next level. To move beyond common web sites and infrastructure to start to integrate government employees into a single ecosystem of public servants focussed on better servicing the needs of the citizen. This isn’t a new concept, like it is in some commercial companies where competition not collaboration is embedded in the culture. Collaboration is natural in public services, but what is needed is a focus on exploiting the latest social collaboration technologies to create an environment where expertise can be reused instead of replicated, knowledge can be shared as a by product of users’ day to day activities, and inter-departmental collaboration can reduce the cost of delivering services. Cross departmental collaboration, cross agency collaboration, cross public sector collaboration – and, indeed, collaboration beyond to include local government, the third sector, delivery partners and small & medium enterprises who can help to service the citizen’s needs. 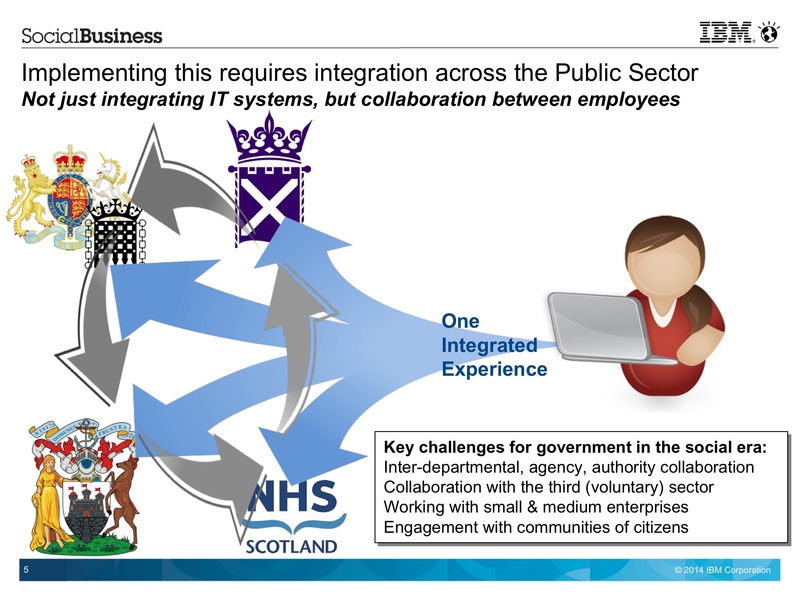 The first challenge for government was integrating services – the next is integrating people. 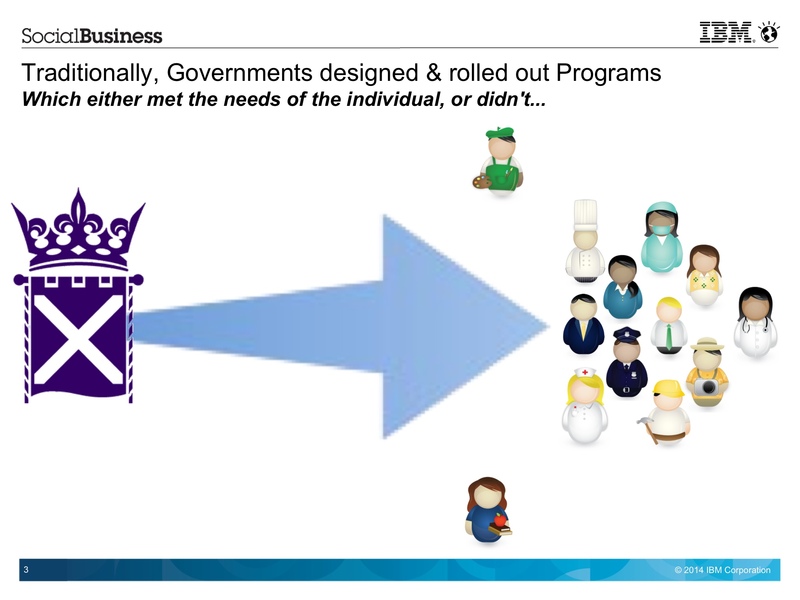 In IBM, when we think about how public services can be taken to the next level we build stories about how cross government collaboration could save costs and change the lives of citizens. Could we help departments respond to freedom of information requests faster and at lower cost? Could we make it painless for a citizen to complete their tax return? Could we make it easier to claim benefits by removing barriers while reducing the chance of fraud? Could collaboration between local government social services, the police and school teachers save the life of a child? Now that would be something to be proud of.